ISOFIX - What does it mean? Sign up to our mailing list and receive exclusive offers, info on the latest Jané products and early access to private sale events. Ideal for compact Beds. It's flexible and easy to use and perfect for helping the transition from cot to bed. Suitable for children from 18 months to 5 years approx. Raised hinged designs (18cm high) allows it to work with beds that have a raised board around the mattress. Designed for a minimum sized mattress of 90 x 190 cm, measuring a minimum of 10 cm and a maximum of 20 cm high. This Bed guard is collapsible and folds away into its own travel bag for easy storage and transport. 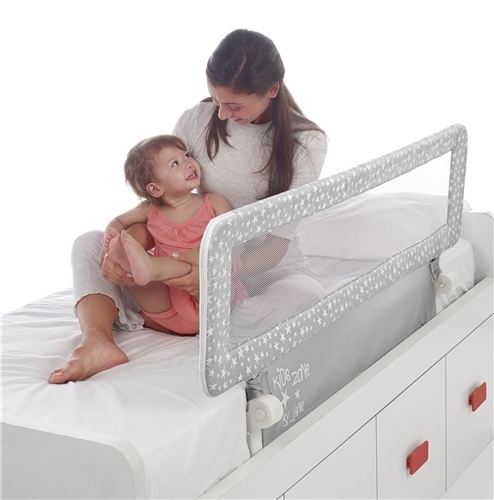 The soft mesh panel can simply fold down to allow easy access when your child is climbing in and out of bed. It's continuous support bar which slides under the bed mattress is designed so to allow the bed guard to be used even on cots or beds with slotted bed bases. Mesh panel soft to touch if child accidentally bumps into it. Attractive design to amuse your child. Complies with the BS7972:2001 + A1:2009 regulation. Buy online securely. We are PCI Level 1 compliant. All major credit cards are accepted.